We take pride in making happy fence owners and that stems from our commitment to delivering on top quality from the start. Delta Fence & Construction in Escanaba, Michigan has been selling and installing fence since the early 1980’s. National leaders in design and manufacturing of fencing equipment, Jeff Lancour and Ron Chouinard are experts in their field. You can learn more about that company at www.lcenterprises-usa.com. The passion for the fence industry at Delta Fence & Construction dates back over three decades when Jeff and Ron set out on a mission to making fencing more efficient. 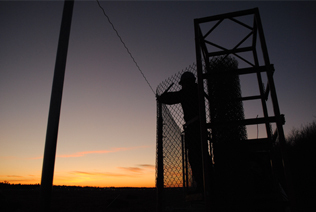 Delta Fence and Construction have been fortifying homes and businesses ever since! We will take the time to help you design your layout, make sure you have the necessary materials and show you how to install fence yourself. We also offer estimates for projects that the experienced crew at Delta Fence will install for you. 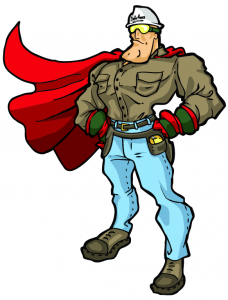 Our superhero, Fenceman, sets out to save the day by protecting families and pets from would-be disasters. Speeding cars, ferocious wildlife, and burglars don’t stand a chance against Fenceman. Learn more about our superhero on our Fenceman! page.